A completely waterproof version of the ECS Ventair ventilator. In cases of excessive water flow over the decks or coach roof, an inner sleeve complete with flush handle, is closed by moving in an upward direction to ensure 100 percent waterproofing. This simple operation is carried out from within the cabin or wheelhouse, and vice versa, a downward motion returns the unit to the standard Ventair version. This inner sleeve in no way inhibits airflow under normal circumstances. 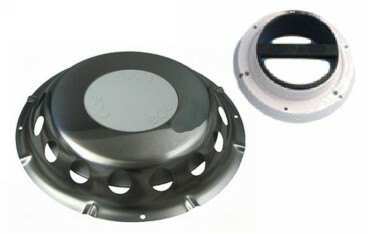 Inner baffle fits into deck aperture 92mm.